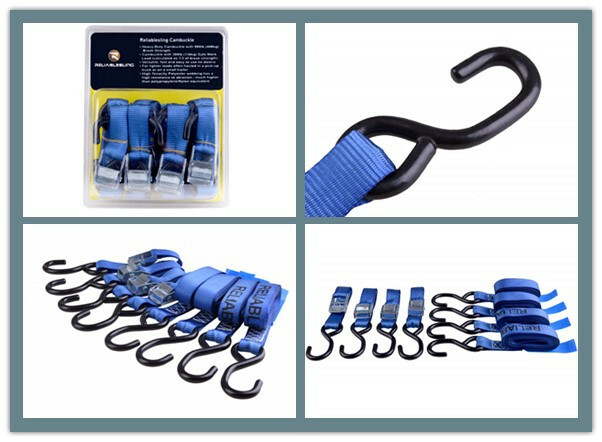 The cam buckle tie-down is fast and easy to use, with a padded quick-release thumb button and compact non-marring vinyl coated S-hooks. The cam buckle's teeth securely grip the blue webbing. 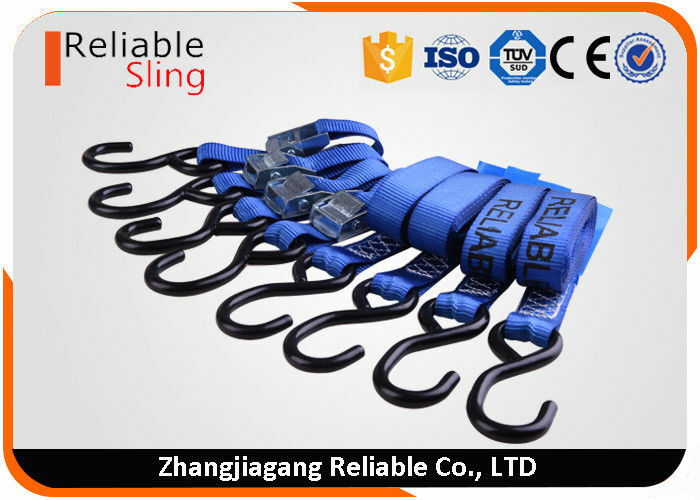 Reliable Sling is the expert and leader in branded products and services people trust to ensure their personal property is reliably secured, transported, and stored. These well engineered products are the most trusted to provide unique, simple solutions for specific everyday needs, offering reliability, security, safety, and ease of use. Inspect webbing strap and cam buckle before each use.DO NOT use tie downs that are worn or frayed due to outdoor elements. Be certail that the area of attachment will be strong enough to withstand strap tension and excess forces resulting from unexpected shifts during transport. NEVER overtighten.Stand clear of hook and strap rebound path when using tie down.Never use additional bars or levers to apply tension. Store product indoors when not in use. Tie downs are not for lifing,pulling,towing or carrying human weigth. Failure to understand all instructions and warnings before using this product may result in personal injury or property damage. For maximum strength,hooks and buckles must be in line with direction of pull. Protect webbing from sharp edges,hot surfaces and acids. DO NOT USE extension bar lever,plier or any tools,USE hand power only. 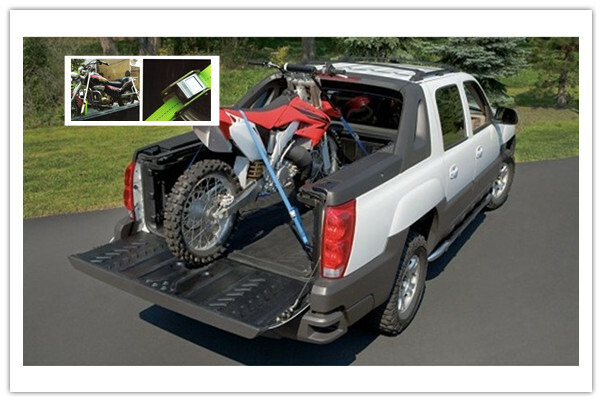 Attach Tie Down hooks to handlebars or frame member,where it will not slip side to side. Tie Downs are consumable products and will break down in time and use through exposure to the elements and weather.